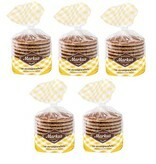 The delicious taste from the stroopwafels are considered as very yummy. Shelf-life from this stroopwafels goes up to 4-6 weeks. If you want to go for stroopwafels with a longer shelf-life click here. Those stroopwafels do have a shelf-life up to (around) 1 year.